Home › Windows › Condensation and Windows › Where Does It Come From? 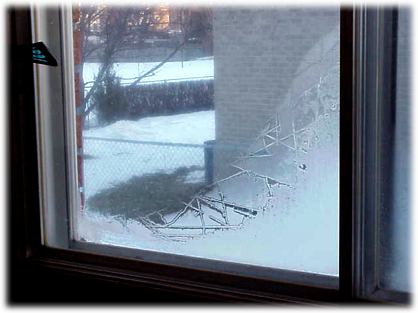 Superficial condensation occurs when surface temperature on the interior side of a solid window surface, such as the sash, frame or glazing, is lower than the dew point of the humid air in its immediate vicinity. The moisture naturally present in the air in the form of vapour, condenses on contact with these colder surfaces. The resulting droplets form a film of water and eventually trickle down the glass. The higher the humidity level in the air or the colder the surface, the heavier the condensation can be. Condensation will often occur at the bottom edge of the glazing because of conduction through the spacer and air convection within the glazing cavity.